I woke up this morning with an uneasy feeling, one that had been building up through the days. I sat and wrote on my journal. It has been my habit to journal in the morning, before I leave my room for breakfast. But on days when I have to leave early for work, I take the journal with me and write where I can, when I can. Although I had been journaling for several decades now, it never ceases to amaze me how this writing tool can transform the heaviness within into a feeling of lightness; how, when the feelings that had been hidden, can become beacons of light that give direction to my day when they are brought out into the light and expressed in writing . I have written much about this amazing and transformative writing tool in several blog posts. 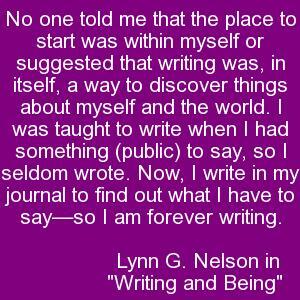 In this post, I would like to feature some quotes on journaling from the book, “Writing and Being,” by Lynn G. Nelson. It is one of the best books on journaling that I’ve read – certainly a must read for those who are just beginning to journal and anyone in need of encouragement in journal writing. “Talk to yourself in your journal. Get to know yourself. Go slowly. Go gently. Make your journaling a special time. Very wise words. I love to write out how I’m feeling, it definitely helps me cope with difficult emotions. There’s something about putting it all down on paper that definitely leaves you feeling much better! How true, writing on our journals help us explore the pain or confusion we feel during difficult times. Journaling is like a sounding board…very therapeutic indeed. Ah Cecil, yet another powerful quote! Thanks! You’re most welcome, Ma’am! I’m indeed moved by this article 🙂 More power. Oops sorry – I have found that writing publicly about things that are personal to me helps me to think more carefully about what I really mean and how I really feel. It is very liberating. This is something I am just learning now, Jinny. Writing publicly about how I really feel. Thanks for your input. It is encouraging to know that writing publicly about personal feelings is liberating. Thanks for the reblog, enissa! I too find Journaling a very healing tool and one that I practice whenever I can or have the disposition to do it. You have a very beautiful way of writing. I honestly feel if more people journal, the world will be a happier place. Thanks for the kind words!